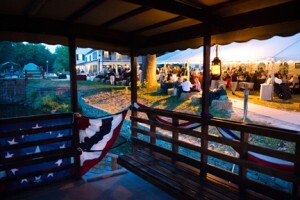 Each year, the C&O Canal Trust hosts Park After Dark, the major fundraiser that supports the C&O Canal National Historical Park. The C&O Canal Trust raised $140,000 at this event last year, money that helps preserve the Park’s historical, natural, cultural, and recreational resources. Programs such as Towpath Forever, Canal Classrooms, and Canal Quarters assist the Park in meeting needs not covered by federal appropriations, to keep the Park safe and enjoyable for today’s guests and for future generations. Park After Dark is a unique event held under the stars at the beautiful Historic Great Falls Tavern at the Park. Attendees kick back and enjoy live music, dancing, great food, libations, unique auction items, a campfire, and much more! Each year, the event hosts approximately 300 Canal lovers, made up of both sponsors and ticket buyers. This year, the Eighth Annual Park After Dark will be held on Saturday, September 15, 2018 at 6:00 p.m. Sponsorship Opportunities are available. Download the Sponsorship Packet here. Contact Patricia Barber, Director of Development, at 301-745-8880.